As we were getting ready to leave for church this morning, I was holding my 20-month-old son in my arms, and took a moment to point out the crucifix that is hanging near our door. "See, Gabriel?" I said. "That's Jesus. We're going to worship Jesus." Gabriel knows quite a few words, including "cross" and "Jesus." But today, he pointed to Jesus' navel and said, "Button!" I laughed and responded, "Yes, that's Jesus' belly button. Good job." Sometimes we need the eyes of a child to see things that are so mundane that they are invisible to us. Reflecting on my son's observation, I marveled at the fact that God's Son had a belly button. Think of it! He was not just made into the likeness of a man. The eternal "I AM" became flesh, was tethered to a human mother by an umbilical cord, and then squeezed through a birth canal, just like you and me. I was thankful that God gave me this little teaching moment, and that it came from my infant son. I've said it before, but this little anecdote makes it fresh again: we need images of Jesus in our churches. 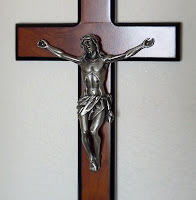 I think it is especially tragic that the crucifix has fallen out of use in so many Lutheran churches. 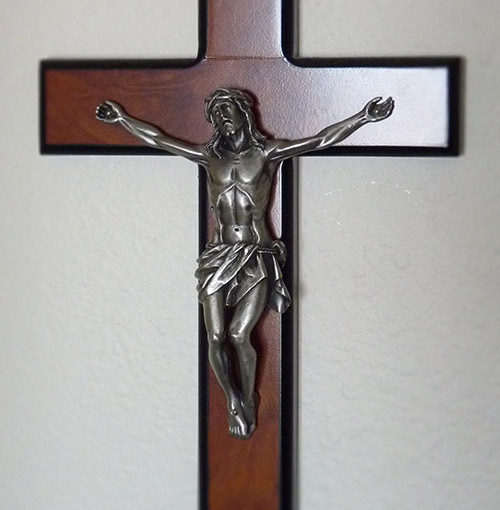 The crucifix is not just a symbol, and it is certainly not for decoration. It is a tool for teaching, for both children and adults. I am becoming convinced that nurturing an abstract aesthetic in our churches (typically broken only by a few banners and an empty cross) is contributing to an abstract—and ultimately unbiblical—notion of God in young minds. There are many attractive alternative ideas of god in our pluralistic, postmodern society. Many believe that god is a transcendent, benevolent being. He/she/it is everywhere, loves unconditionally, and is the source of all good. While this is partially true, what makes the God of the Bible different from the abstract Sunday school god is that he became part of his creation. He stepped into human history, making himself incarnate, and allowed himself to be killed on an implement of cruel torture. He suffered the torments of hell in my stead, for my sin, because he could not bear to see me perish. This is our God. This is the gospel. Are we ashamed to preach it? And just as importantly... are we ashamed to show it?